The company Focquet, originally named “SA Etablissements Charles Focquet & Cie NV”, was founded in 1892 in Brussels. Initially, its core business was the purchase, repair, sale and lease of electric generators, steam-powered equipment and gas-powered machinery. In 1898, the company decided to build a new factory in Vilvoorde (near Brussels) in order to expand and deal with heavy machinery. The company operated at that time mainly in Belgium, the Belgian Congo as well as in other countries such as Egypt. Then, due to the gradual replacement of steam-driven motors by diesel motors in the years 1950-1960, Focquet decided to reorient its activities around reconditioned electric machines. The company will then be modernized and restructured in the 1990s. Since this restructuring, the company has experienced an uninterrupted growth. In 2014, the company decides to build a new factory in Gembloux and moves there in November 2014. This move will be strategic for the image of the company. Its storage capacity increased to more than 5,500m2 and the company modernized with the establishment of a high-performance computerized inventory scanning system that allows faster processing of its clients’ demands. The new site includes a shop with a surface area of 5,500 m2, a workshop for electrical machines and a workshop for pumps, as well as offices adapted to the current and future needs of a growing company. This large-scale move allows the company to enjoy more than 20,000 engines in stock and to strengthen its major asset: a complete inventory to quickly respond to customer needs and ensure rapid delivery to customers. Its 125 years of experience in the market have enabled the company to become a dynamic, international company responsive to its clients. Focquet remains a family company who share their experience and know-how since three generations. It has for several years been surrounded by a strong team of fifteen engineers and specialized technicians in order to better meet their customers’ needs and offer them tailor-made solutions that are fast, reliable and of high quality. 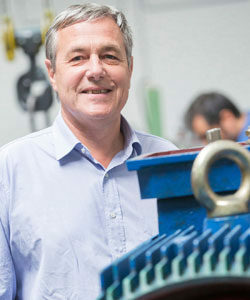 Over the years, the company has acquired a strategic position in both the Belgian and international markets and has steadily increased its reputation. As a result, the company has become major player in the market of industrial power equipment.